ElectronicKitSchool. - The portability and capability to charge any cell in smartphone while traveling and during emergency requirements make the power bank modules today have obtained significant popularity. There are many power bank modules today offered to user with many features and specification. Usually the price of power bank module will determine the quality and capacity of power bank. It true if the more expensive the price of power bank module it indicate the power bank have better quality and capacity than lower price. In this article, we will not discuss more about the development of power bank module today, but in here we will give you one electronic design of smartphone power bank circuit with a low dropout voltage based on LM1086 IC like in Figure 1 below. 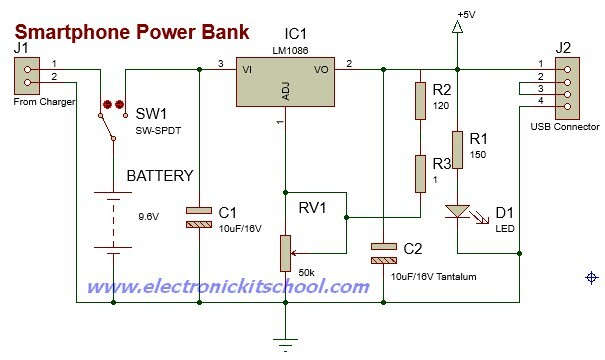 This circuit design to result 5 volt output voltage from the rechargeable cell battery 9.6 volt that come from 8 cells. The main component in the circuit like in Figure 1 above is IC1 LM1068 that will give a regulator with a maximum dropout of 1.5 V at 1.5 A of load current. Two resistors are required to set the output voltage of the adjustable output voltage version of the LM1086. Fixed output voltage versions integrate the adjust resistors. According the data sheet of LM1068, usually this IC used in many application like High-Efficiency Linear Regulators shutdown, Battery Chargers, Post Regulation for Switching Supplies, Constant Current Regulators, and Microprocessor Supplies. From the Figure 1 above that when the S1 SW-SPDT switch function as select between charging voltage into rechargeable cell battery 9.6V and battery to charge the circuit output. Rechargeable cell battery can came from battery of 8 cells Ni-MH of 1.2 volts current 1,000 mAh on AAA type that pack together series to get voltage of 9.6 volts. In here you can charge this batteries by use the circuit Multi NiCAD Battery Charger Circuit using LM317L can make by yourself. Note in this condition that you should make sure the battery is fully. When you want to get automatic charger you can use circuit 12V/800mA Automatic NiMH (nickel-metal hydride) Battery Circuit Based on TL072 IC. After battery fully charge, now you can use it to charge all various smartphone. You only need to slide the S1 SW-SPDT switch at portion the charge USB. Now, the voltage from rechargeable cell battery will be connected to the adjustable output voltage regulator in LM1086. The voltage from rechargeable cell battery will be entered to the input pin of IC1. Capacitor C1 function as a filter of input voltage from battery. It is also with C2 that similar of function with C1. Note that the C2 should use the tantalum electrolyte capacitor type to get a great stability of output. RV1-potentiometer connected with both resistors R2 and R3 for adjust the output of IC1 to suitable to charge with suitable devices from voltage port USB 5 volts. The output voltage that came through the adjusting completely, will be send to the J2 which is port USB type A female form. D1-LED is used into indicator power on of this circuit that is charging perfectly after protected with R1.